Now an affectionate companion, the Bull Terrier arose from the "Bull and Terrier" crosses, originally bred for dog-fighting. When bullbaiting was outlawed in England in 1835 the "sport" of dog-fighting became popular and a smaller dog breed was needed, that could be more easily hidden under one's coat at the arrival of the police. These dogs also had to be more agile and light as the dog fights usually lasted longer than bull fights. This new type of fighting dog was created by crossing the olde type bulldog with different Terriers, among which the Manchester Terrier (or Black and Tan Terrier) - before it was dwarfed down - . This Bull and Terrier cross combined the alertness and agility of the Terrier with the power, tenacity and high treshold of pain of the Bulldog. It got the reputation of a 'canine gladiator' which would fight to the death to please his master. It was much leggier than the Bull Terrier we know today and its head more closely resembled that of the early Bulldog. 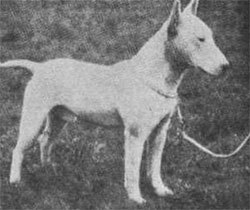 In the early 1850, James Hinks, of Birmingham, England, first standardized the breed by selectively breeding the old type Bull Terrier with other breeds, including the White English Terrier (now extinct), to obtain a longer head and a more symmetrical body and get rid of the bowed legs, The result was an all white Bull Terrier with a cleaner outline, tight shoulders and well bent stifles. 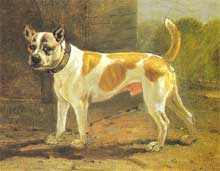 For his entire life James Hinks only bred white dogs, which he called 'Bull Terrier', in order to definitely distinguish them from the Bull-and-Terrier which was very similar to today's Staffordshire Bull Terrier. The breed was first designated as the "Hinks Breed" and was also referred to as "The White Cavalier", as he was bred to defend himself and his human family but not to instigate hostiliy. Which other breeds were further crossed along the generations to obtain the modern Bull Terrier with the unique egg-shaped head is still a matter of conjecture. Most sources agree that Dalmatian blood was infused to confer the breed a more elegant look and gait and longer legs. Some authorities believe the Spanish Pointer, Greyhound, Foxhound and/or Whippet were crossed along the lines. Borzoi and Collie may also have been crossed into the gene pool to elongate the head even more and to arrive at a type of dog with a stop ever less marked. Until 1895, when cropping was outlawed, the ears of the Bull Terriers were cut as closely as possible, so that they would not be torn by the dog's opponent during the fight. From that date on ear cropping became prohibited and breeders sought to breed exemplars whose ears were in harmony with the rest of their body. The breed suffered a setback while breeders attempted to obtain the required upright ears without losing other qualities. In 1917, the first modern Bull Terrier, Lord Gladiator, was born. It was the first dog with a skull profile completely lacking a stop. Due to problems associated with the white color coat (deafness, albinism) some experts suggested to introduce other colors in the breed. The man who is known for the development and acceptance of colored bull terriers in the ring is Ted Lyon, whose preferred color was brindle. The first Bull Terrier Club was created in England in 1887. In 1888, the Bull Terrier Standard was published by the Bull Terrier Club. 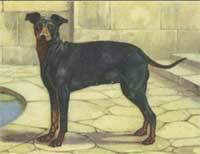 The breed was recognized by the American Kennel Club in 1895. In 1992 the AKC recognized two different sizes, the Standard Bull Terrier and the Miniature Bull Terrier. Today's Bull Terrier is athletic and always eager to play. Their clowning antics and energy make them delightful companions. They need a firm hand and consistent training, but most of them will tolerate other family pets. Their cute and photogenic face make them very popular subjects in dog photography and advertising.